The Billionty-Oneth Geek: Punk Rock Jesus! Punk Rock Jesus. The title alone caught my eyes. Then I saw the plethora of positive reviews. And then I read the synopsis. I knew quickly that I needed to read this book. 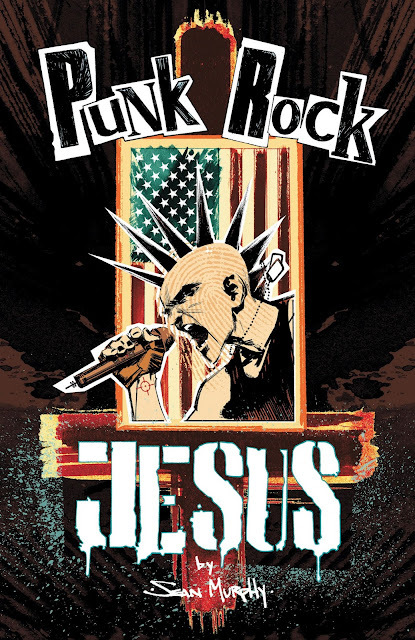 Written and drawn by Sean Murphy, Punk Rock Jesus tells a fascinating story about a corporation who is able to clone Jesus and shepherd him (or Him?) to become the world’s biggest reality TV star. Like all good corporate sequels, the whole event and his show is dubbed as “J2”. He is birthed by a young virgin teenager named Gwen Fairling, who was chosen from a worldwide full of hopefuls. She names him “Chris” as it’s pretty close to “Christ”, she explains. We follow Chris as he grows up before the eyes of the world and see all the trials and tribulations that he goes through, as a corporate “Christ”. As he becomes a teenager, he begins to reject all things religious, becomes an atheist, and joins a punk rock band to fight the religious, societal and corporate powers alike. I think this is the first comic book where I can say that I felt uncomfortable reading, but not in a necessarily negative way. Rather, the book was able to push some of my buttons in a way that comic books haven’t done for me before. That feeling of discomfort was outweighed by intrigue in seeing where the story was going and how the conflicts would be resolved. The story is full of twists and turns to keep things lively. Murphy does an excellent job of crafting believable characters, and although you might not get behind every single one of them, you can clearly see where they are coming from. As I was reading PRJ, it was evident to me that this was a really personal story for author Sean Murphy. There’s just so much dialogue that you can tell is bleeding from a real world conversation. And perhaps that’s why the story seems so intriguing. The book ends with an afterward by Murphy explaining his personal faith journey, and how he ended up where he is today as an atheist. As a Christian, although I don’t personally agree with some of the sentiments he expresses, I can respect where he’s coming from and appreciate that he would feel challenged by faith at all. I’ve always believed that one experiences the most growth when they are challenged or feeling doubt. Granted he’s become an atheist now, but I would hope that he wouldn’t stop asking questions about faith and even challenging himself. The whole experience of reading PRJ made me appreciate the comic book/graphic novel medium even more. Not only can you read fun and pop-titles about superheroes battling super villains, but there’s also engaging stories full of real life stories, conflicts and scenarios. If you’re the type of person only into superhero books, I can encourage you to explore other realms and avenues within the medium. There are truly some great stories out there. Until next time, later geeks!